The Austrian artist Maria Lassnig (b. 1919) is recognized as one of the most important contemporary painters and can be seen as a pioneer in many areas of art today. 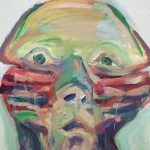 The exhibition at MoMA PS1 in New York presents works by Maria Lassnig from all periods of her career, most of them never previously exhibition in the U.S. and spanning her early involvement with graphic abstraction in Paris and Art Informel, to her later shift to figural representation. The show features approximately 50 paintings drawn from public and private collections and the artist herself, as well as a selection of water colors and filmic works. The exhibition runs until May 25, 2014. 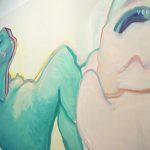 Maria Lassnig at MoMA PS1, New York. Press Preview, March 7, 2014. Video by Shimon Azulay.